Black, the ever-versatile colour. has had a long and interesting history, what it represents, how it is worn and by whom. This of course extends to film as a highly symbolic colour, it's so frequently used that we don't even question it, the villains wear black, they ride a black horse, their castle is black and somehow when they are in power even the sky turns black. There is the white knight and the black knight, the cowboy in the white hat and the villain in the black. But now days it seems almost any character can wear the colour regardless of their moral alignment, is this representative of the more complicated roles characters play in modern film? Is it simply a change in taste and how we as an audience respond to the colour? In theatre, costumes are generally brightly coloured as they need to be visible from the back row, there are exceptions of course, Chicago comes to mind, which has a very monochromatic pallete overall, they swap colour for texture with the use of shiny, reflective materials that work well under stage lighting. Cinema has the advantage of controlled lighting and close camera angles, so minor details are visible to the whole audience as you can see in the image above. 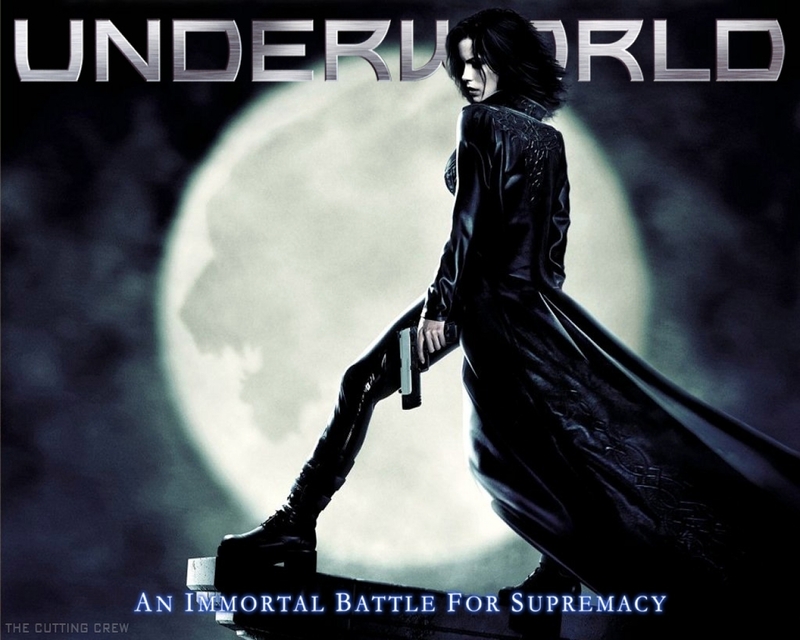 Though almost all the characters in the Matrix wear nothing but black, they each have their own unique textures, Trinity is like an oil slick in her shiny latex, Neo has very matte fabrics that barely interact with light and Morpheus is in heavily textured leathers. On stage, none of this would translate, but in film it it highly effective in establishing something about each of the characters. But why dress the heroes in black? I say why not? Black has not always had negative connotations. Black was one of the earliest colours used in art, going right back to cave paintings, as charcoal was the most easily available drawing tool. In ancient Egypt it had a positive connotation, representing rich soil and the fertility it brought to the land, it was also connected with Anubis the jackal god that protected the souls of the dead in the after-life. 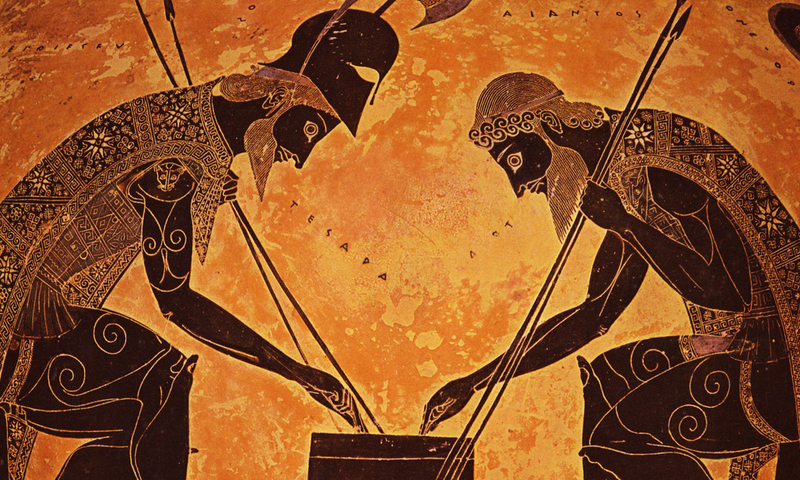 In Greece it was also associated with the after-life, Tartarus and the black featured heavily in their clay pottery art. In clothing it was a seldom seen colour of the ancient world as it was extremely difficult to dye fabric that dark and keep it that way with primitive vegetable dyes. In Rome craftsmen and artisans wore black robes although they often faded to shades of brown or grey, Rome was also the first civilzation to make black the colour of mourning, a tradition that continues to this day. On a somewhat related note, a traditional Spanish bride would dress in black to put emphasise on the vow "til death do us part". It was not until the early middle ages that black became associated with demons and witchcraft and evil in general. Ironically, Benedictine monks adopted the colour into their robes around this time, which was met with some controversy as they were the first to do so. Now days almost every religious order has worn black at some point, in this context it can be seen as a symbol of humilty and penitence. Around the 14th century, good quality dyes made it possible to create fabrics that retained the deepest hues. However it was a rather expensive process and was worn only by the upper-class, in particular magistrates and government officials, it seems some things never change and later still it became the colour of nobility beginning in Italy, then spreading throughout all of Europe. By the 18th century the colour had fallen out of fashion again what with the light pastels being the most popular colours of the baroque period. Black would return after the French Revolution and by the 19th century it was a standard colour of business dress and the upper-classes, it also came to represent, rather contrastingly, the Romantic movement as well as the Industrial Revolution and a lot of machinery was manufactured in black, everything from trains and cars to sewing machines and telephones. In this context black can be seen to represent durability and functionality. The 20th century is where black gets the most interesting in the shortest span of time, in WWII it was the colour of Italian and German fascism and yet ironically a few decades later it became the colour of choice for anarchists and rebellious youth. Film and television would be very influencial in these changes. In the age of black and white feature films begining roughly in the 1910's costume designers naturally had to think monochromatically, ergo black made a dramatic impression and stood out far more than any colour would and this is probably the most significant era in cementing the modern world's belief that black is a colour of evil. Nosferatu, the Wizard of Oz, Frankenstein, Dracula, the Cabinet of Dr.Calligari just to name a few films all put their monsters and villains in black costumes. It's probably one of the most rudimentary examples of symbolism costume design ever utilised. Meanwhile in the fashion industry...In the 1920's Coco Chanel is revolutionizing black into a colour of absolute elegance and sophistication in the form of the iconic Little Black Dress. This became the uniform of the femme fatale, of dangerous and exciting women, most notably in the film Gilda (1946). Audrey Hepburn's most famous role as Holly Golightly in Breakfast at Tiffany's was also what established her as a style icon, wearing a black silk Chanel dress and dripping with Tiffany's diamonds. It was so fashionable it hurt and had that dress been in any other colour I doubt it would have been considered as ageless. By the 1960's black was firmly established as the sexiest colour known to the human eye, for there is nothing more beautiful and timeless than women in black silk dresses and men in black leather jackets, the latter coming into being at first for purely practical reasons when riding a motorcycle. Because of this association, this is when black started to become the colour of rebellion and has stayed that way ever since. 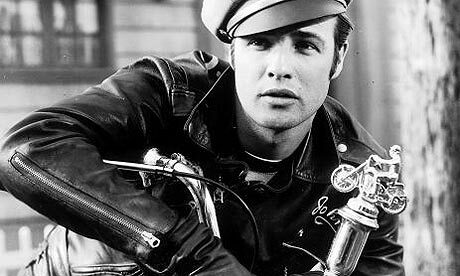 Bikies, punks, goths and any other kind of non-conformist has always chosen black as their colour of choice. Oh the 80's and 90's, the middle children of history, a relatively peaceful time when capitalism reigned, the economy was good and the middle-class thrived and yet stories created in this period are darker, angstier, cynical and more existential. Anti-heroes took the place of the lawful white-hat hero, no one wanted a Captain America, they wanted the Crow or Spawn or Blade or the Punisher. Even characters that existed long before that like Batman got restyled as intense, gritty characters who could have at any other point in history been considered the villain. Hell, the Terminator went from a villain to a hero between the first and second film! 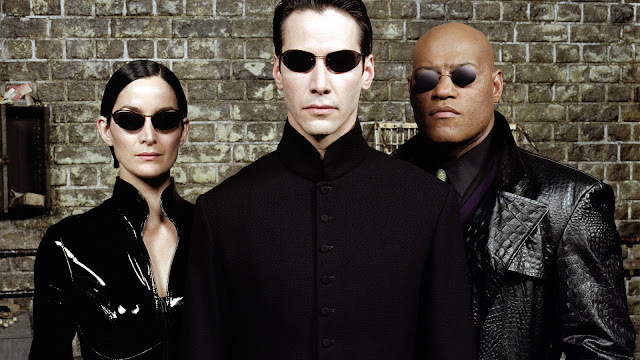 The Matrix was released in 1999 and is generally regarded as having very iconic, unique costumes when really it was a reflection of fashion around at the time, particularly the raver and goth subcultures, they just turned it up to 11. However the influence that film had on culture from that point on is unfathomable, black rubber and leather, boots and long coats became the uniform for every superhero or action hero for the next decade or so. Every Batman film put the eponymous hero in black rubber armour, while Catwoman set the trend for tight latex catsuits, because this is what we would want to wear in combat right? Even the X-Men films did away with their colourful costumes and dressed them all in black leather jumpsuits. It wouldn't be until recent years in X-Men: First Class that we saw them in yellow and blue uniforms because I think we are moving back into an era that isn't afraid of colour. Fiction is directly influenced by the world around us and this is a pretty dark and confusing time we live in, therefore we are becoming nostalgic and looking back to a time when our heroes are more clearly defined and also more colourful. We've brought back the Marvel heroes, Doctor Who and Star Trek all in less than a decade, these are stories where the villains are less redeemable, usually just monsters or terrorists, the latter of which is yet another reflection of our society. So where does black stand in film and fashion right now? In fashion, I don't think it's going anywhere, for almost a century it's been the considered the height of style, the most sophisticated colour and the most practical colour, unchanged by time or trends and some people, especially artists, wear nothing but black. Neil Gaiman, Adele and the class of costume designers I studied with spring to mind. And of course this extends to film, but when it comes to action, sci-fi or superhero films I think we overdid it just a little and it has now become a cliche most savvy costume designers want to avoid, franchises like Resident Evil or Underworld kind of trapped themselves because they started in a time when the "Matrix look" was cool. And as I stated in my Tron: Legacy review, black rubber can still work, you just have to be smarter about it, just puting your charcters in all black rubber armour or a costume with a long leather coat and massive boots is becoming a relic of the past. Next week- Mass Effect, dealing with costumes in a digital world and dressing multiple alien races.